As aquaponic and hydroponic technology continues to advance, major players in the vertical farming industry are planning to expand into new products and new territories. Klein’s company, which serves the Chicago area and has partnerships with major retailers like Whole Foods and Mariano’s, started in 2010. 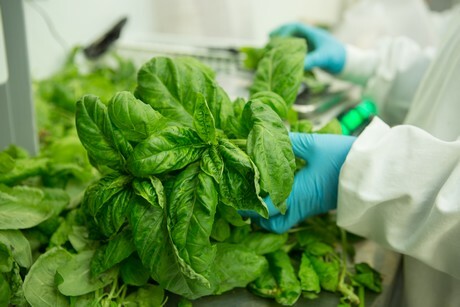 According to Klein, organic basil was a natural choice for the company as the crop responds well to indoor farming, growing larger than Californian and Mexican crop. 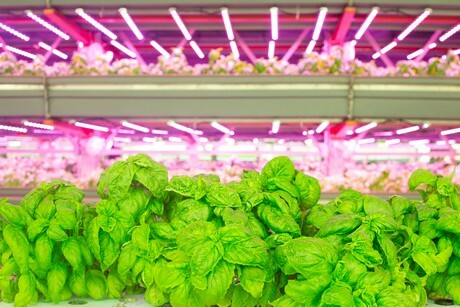 Basil also loses freshness quickly, giving FarmedHere – which delivers its produce directly to retailers each day – an edge in the Chicago market. Klein says that sales have increased every year of the company’s basil program. “We’ve actually increased the overall market for basil in the markets that we sell in.” In response to strong demand, FarmedHere doubled its basil production in 2015, and Klein says sales growth kept pace with the increase. According to Klein, the strong response to FarmedHere’s program is largely thanks to growing demand for local and organic produce. “From all the research we’ve done, the demand for local farming exceeds anyone’s ability to supply it.” Klein – and others in her field – believe that climate-controlled, hydroponic/aquaponic farms can help fill that gap. FarmedHere recently expanded its growing program to include microgreens. “We began growing microgreens in the summer of 2014,” says Klein. “We launched [our microgreens program] with Whole Foods in February of 2015.” Klein reports that response – based on both sales and customer feedback – has been strong. FarmedHere is hoping to expand more than just its product line in 2016. As with other vertical farming operations, Klein’s company is looking to new markets where the demand for fresh, locally-grown, year-round produce has created openings. Long-term, FarmedHere has identified 18 cities as targets for expansion. “If we have farms in 18 cities, we’d be able to reach 75% of the national market,” says Klein.